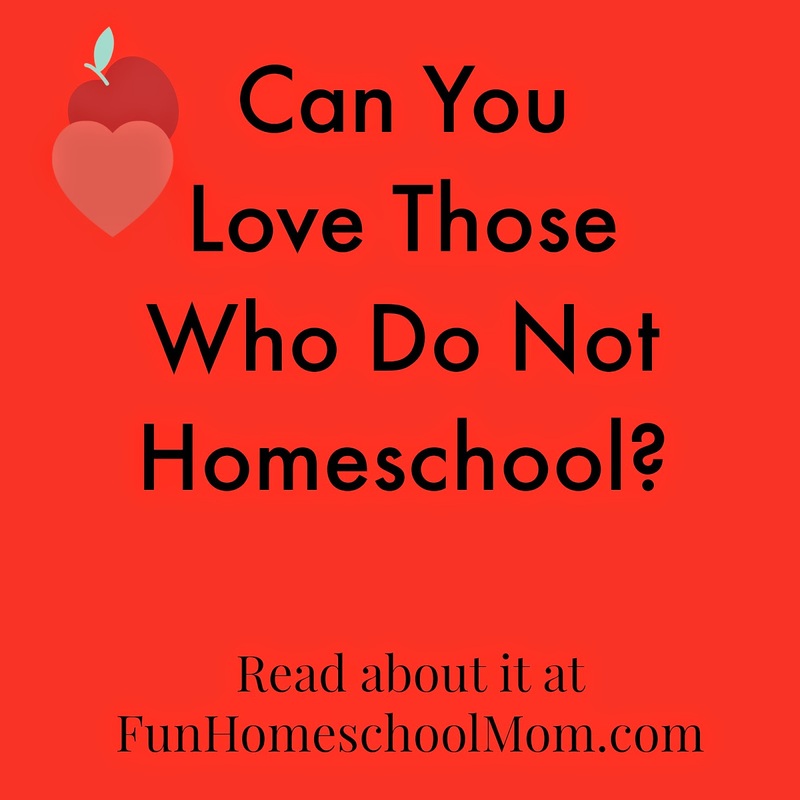 Fun Homeschool Mom Blog: Can You Love Those Who Do Not Homeschool? Can You Love Those Who Do Not Homeschool? I felt saddened reading a recent post on a Christian homeschooling Facebook group to which I belong. A mom had to defend another woman's decision to not homeschool this year due to financial, health and other considerations. The post was asking homeschoolers not to "judge" others who do not homeschool. The way I see it, other's response to this woman's decision not to homeschool goes far beyond judging to meanness, hardness of heart and lack of compassion and empathy. How unlike our Lord and Savior, Jesus Christ! No wonder Christians are often seen as the bad guys in discussions of kindness and compassion and treated as hypocrites by those who know what the Bible states about these things. Even it could be considered a sin to choose one educational choice over another, we must ask ourselves, "How did Jesus deal with sinners?". The answer is: with the utmost compassion. We are commanded by Jesus to first and foremost love. These are the two great commandments he left us. Jesus also says that those who love him will follow his commandments. Can you love those who do not homeschool even though you feel very strongly that homeschooling is what God has called you to do? If you can not, ask God to help you. As a born-again believer and child of God, you are filled with the Holy Spirit whom Jesus promised would guide us and be our counselor. Your Heavenly Father will give you that which you seek in accordance to his will. He does not demand of us what he does not help us to do. Pray that God will change your heart. Your heart will become hardened towards all those who do not see as you do, limiting opportunities for you to build relationships with others to bring them to Christ. You will raise up little Pharisees who will look down on other children who are not home-educated which is the vast majority of children in the world right now. Pride may fill your heart as you feel more spiritual and holier than those who do not homeschool. Your superior attitude may not only turn others away from homeschooling, but from Jesus Christ himself. Ask God to search your heart in the matter of your non-homeschooling friends and family and others around you. Ask him to give you the grace and humility to deal with them with compassion, always seeking ways to help them and draw them closer to Christ. I am so sorry that we as Christians often can not trust God enough to allow him to work in others' lives as HE sees fit, not as we feel is best for them. Even more unfortunately, homeschoolers often use "The Bible says.." as a reason to judge others and be their Holy Spirit. God sent his Holy Spirit to live inside of each of us and guide us. For all who are criticized for their schooling or any other choices, we need to remember that we were created to please God, not man, and we must follow His leading no matter what others think.